The most complete guide for anyone looking to gain an understanding of Business Impact Analysis and its practical application in an IT and Non-IT environment. Get a boost your career with this complete Business Impact Analysis eLearning course and PDF textbook for additional study. This certification kit would be beneficial to recent graduates looking to get a foothold in the IT industry, to businesses wanting to implement risk prevention strategies, businesses experiencing internal or external threats to services and production, and to managers wanting to identify potential business risk factors. The Business Impact Analysis Complete Certification Kit is a part of the Core Series for IT, a series of courses available to help career-driven IT professionals stay relevant in their roles in the I.T. industry. Each course in the core series includes a certification upon successful completion. The online learning program is available for a 90-day access period. Identify business vulnerabilities and develop strategies to minimize risk through Business Impact Analysis. Business Impact Analysis provides organizations with an action plan when preparing for possible risks that it may encounter. Become a valued member of your organization by learning the processes and methods of implementing Business Impact Analysis. Business Impact Analysis (BIA) is a vital component of an organization's Business Continuity Plan. A BIA is implemented in order to identify and evaluate potential risks that the organization may encounter and needs to be prepared for. A BIA explores and reveals any vulnerabilities, and then continues with a planning process to develop and design preventative strategies and procedures for minimizing business risks. This on-trend certification kit would be beneficial to recent graduates looking to get a foothold in the IT Industry, to businesses wanting to implement risk prevention strategies, businesses experiencing internal or external threats to services and production, and to managers wanting to identify potential business risk factors. This certification validates your knowledge of specific methods, models, and/or tools. This is essential to professionals in order to be updated on the latest risk analysis trends, and to add to their Business Impact Analysis toolbox. The industry is facing a bold, new world with the amazing developments in Business Impact Analysis technology, and the challenges and the opportunities that this presents are unprecedented. 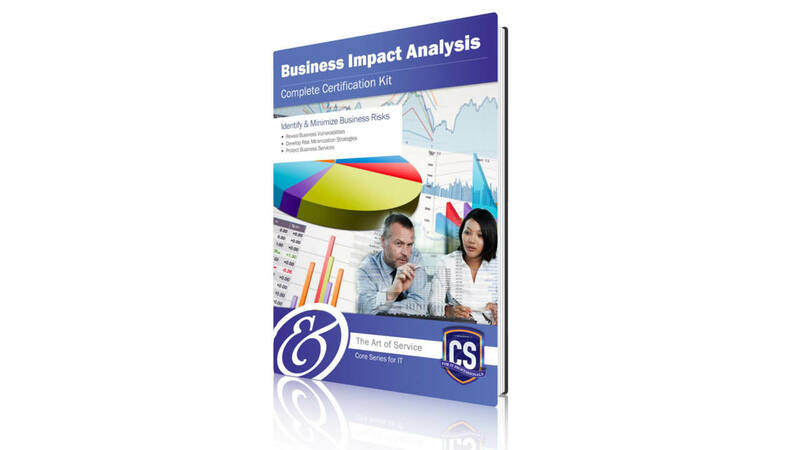 The Business Impact Analysis Complete Certification Kit serves as a complete introductory guide for anyone looking to grasp a better understanding of Business Impact Analysis concepts and their practical application in any environment. The Art of Service's introductory Business Impact Analysis training and certification helps IT practitioners develop the skills that are crucial, as businesses embark on this massive transformation. It provides an industry credential for IT professionals to help them transform into the world of Business Impact Analysis. This training and certification enables you to move both the industry and business forward, and to quickly take advantage of the benefits that Business Impact Analysis applications present. The Art of Service IT Service Management programs are the #1 certification programs in the information management industry. Being proven means investing in yourself, and formally validating your knowledge, skills, and expertise by the industry's most comprehensive learning and certification program. The Business Impact Analysis Complete Certification course prepares you for Business Impact Analysis. - Learning about Business Impact Analysis technologies has never been more affordable. - Latest industry trends are explained. - Acquire valuable skills and get updated about the industry's latest trends right here. Today. - Learn from the Experts. The Art of Service offers education about Business Impact Analysis and other technologies by the industry's best. - Learn at your own pace. Find everything right here, when you need it, and from wherever you are. - Learn the important concepts, tools, processes, and methods of Business Impact Analysis. - Learn about the benefits of implementing Business Impact Analysis processes. - Examine the links to Business Continuity Planning. - Learn about Business Impact Analysis in Contingency Planning. - Explore Impact Criticality concepts. - Research Business Impact Analysis myths and realities. - Overview of Crisis Management and Business Continuity Planning. - Introduction to Business Impact Analysis. - BIA Processes and Impact Criticality. 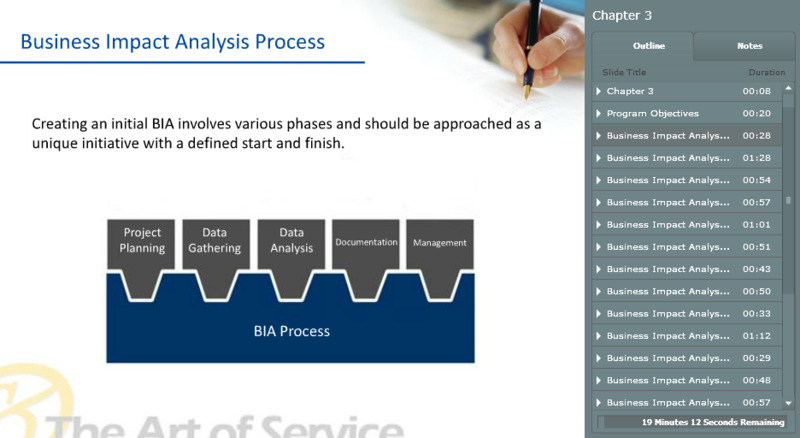 - Methods and Elements of BIA. - BIA in Contingency Planning and IT. - Gathering Data and Common Mistakes in BIA. - BIA Myths and Realities. The recommended minimum contact hours to pass the certification test is 18 hours. The program combines presentations supported by trainer audio. Each module is followed by quizzes and exercises (marking scheme provided) to test your knowledge and competency, and to enhance understanding of the key concepts. A certificate is awarded to your successful passing of the final exam (80% pass requirement) and completion of the course. This is an eLearning Program. Your access details to the eLearning course are in the book. - Downloadable resources (PDF documents). 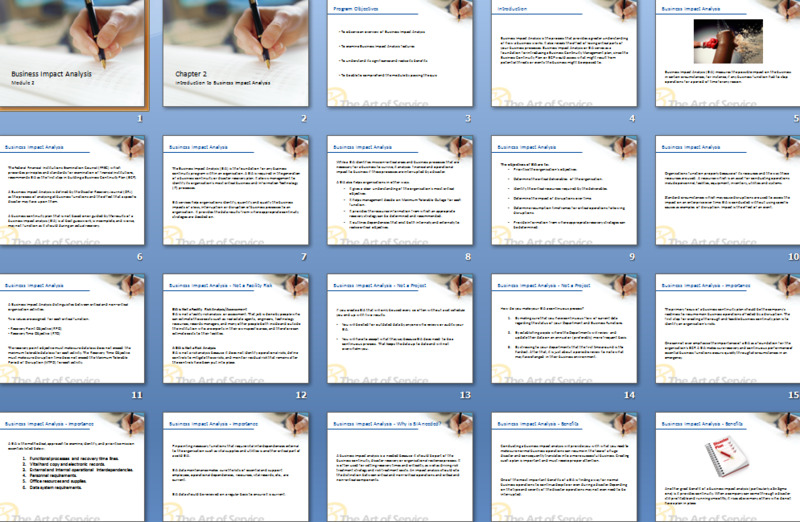 - End-of-module review questions to assess your content knowledge.